See all the colors that you must have in your interiors this fall and winter! As usual, all the color trends of this season are influenced by Nature’s Fall tones like green, brown, yellow, warm and neutral colors! Throughout this article, you’ll find some looks to inspire yourself and help you prepare for this new season! Here is a color that more than likely never even came to your head: Mustard! This color brings warmth mixed with an eye-catching contemporary edge, and it’s very simple to apply in your home, a new cushion, a new lampshade… You can always mixed with accents of oranges and calm grays, and be bold and add a statement sofa or chair to your living room. Shades of gray still dominate the home design world, with darker tones becoming more prevalent and combining perfectly with the ‘must-have’ mustard tones of the season. Grey can look totally at home in a traditional or modern interior design context. This season, you’ll never overuse purple. This shade continues to offer home design a vast variety of room looks based on this popular color and it shows no signs of losing its grip on many of the retailers’ interior ranges for Fall and Winter 2016. Mix the color with some floral patterns, paisley and folk inspired bohemian prints to bring a room totally up-to-date. 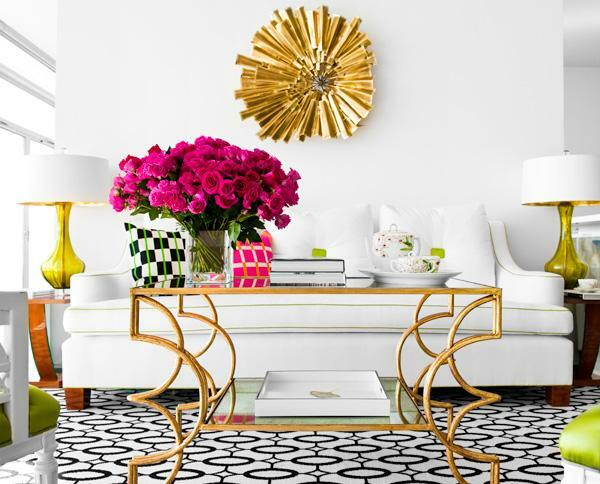 Gold will continue to dominate this season, used as a metallic accent combined with the dark tones trend. Always stunning, gold will continue to chase copper to be the winning metal of choice in your home ambiance this season. We really hope you liked our article. Feel free to pin all the images to your Pinterest board where you keep the best inspirations. You can also visit our Pinterest in order to find more inspirations on interior designs and architecture. Contact us today to get more ideas for your interior design projects and find functional, stylish, sizable and trendy decor choices. Decorate your home inside and outside with gourds, leaves, pumpkins, nuts and other seasonal materials for beautiful fall DIY displays. Squash, pumpkins and a twig of ginkgo leaves (inserted in a flower pick) on mounded moss command attention in this bell jar set atop a terra-cotta dish. Substitute a terrarium, large jar or even a glass cake cover, if desired. Arrange a few spillovers outside the glass for a touch of spontaneity. Vibrant dahlias in carved-out mini pumpkins delight at place settings. We used a candle carver—a small tool that removes candle-size chunks from fruits and veggies. Insert a votive holder as the "vase" for water and blooms. Clear glass containers show off both candlelight as well as colorful materials. Nestle a candle in popcorn kernels or other seasonal materials, such as candy corn or colored clear round stones (available in crafts stores). If you prefer, use a battery-powered candle for safety. Use repurposed candle holders for easy fall displays of small pumpkins and gourds. Look for inexpensive candle holders in varying heights at a garage sale or antiques store, then spray-paint black for a unified look. While the trees may be dropping leaves outdoors, you can preserve them inside on this tree -- perfect for an entry display or party centerpiece. Anchor a branch (we used manzanita from a floral shop) in a decorative potwith floral foam or rocks, then cover the top with moss. Decoupage color copies of gathered leaves onto small cards or hot-glue pressed leaves to cards. Tie to branches with twine or raffia. Add lines of favorite seasonal poems to the back, if you like. Create simple but striking arrangements with autumn beauties. Try cattails, ornamental grasses, cone flower seed heads or dried hydrangea blooms. 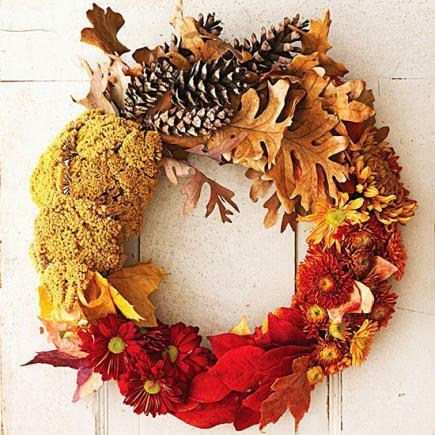 Create this beautiful fall wreath with a variety of materials that reflect autumn's hues: gold, red, orange and brown. Both your yard and a crafts store should provide a bounty of choices. A mix of fresh and dried materials looks lovely, but a wreath of all dried materials lasts longer. Lightly soak a 10- or 12-inch ring of Oasis floral foam in water. Group your materials by color to plan each section of the wreath, then insert materials by the stems. We used tree leaves and fresh mums for red and orange bands of color, tree leaves and dried yarrow for gold, and dried oak leaves and pine cones for brown. Hot glue or T-pins help hold materials in place. Make a leafy monogram to hang on your door for a touch of fall flair. Paint a papier-mache letter and let dry, then hot-glue dried or silk leaves to the layer in letters. Hot-glue a wire loop to the back of the door for hanging.